After – well, let’s just say a while – I have a couple new releases! 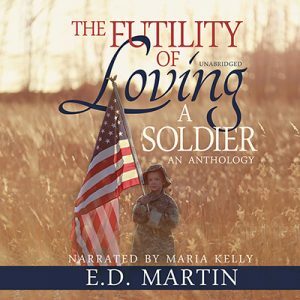 The first is an audiobook of The Futility of Loving a Soldier, narrated by Maria Kelly. She has a beautiful Irish lilt that makes the eleven short stories a joy to listen to. Get your copy at Amazon/Audible or iTunes. The second release is a paperback of “A Place to Die.” I wanted to have print copies on hand for an upcoming book fair event thing but didn’t get them ordered in time. However, you can still get your copy at Amazon. And don’t forget, you can read the story for free if you sign up to my mailing list. If you’re wanting actual new stories, I’ve been posting pretty regularly over on Medium. I’m also nearly done with the first draft of the first book in a new series, which is retellings of fairy tales but with Vikings and no magic. My writing group is loving the first book – the MC was described as “wonderfully prickly” – and they’ve been pushing me to finish. I’m hoping to have the first one out by Christmas, with more to follow over the next year. I also started a Patreon account. One of the tiers includes access to a new story every month. Please consider supporting me – just $1 will give me that extra push to actually write each month!